Mortgage applications for new home purchases increased 2.4 percent year-over-year. Applications decreased by 8 percent month-over-month. The average loan size of new homes decreased from $326,175 in June to $325,843 in July. The delinquency rate for mortgage loans on one-to-four-unit residential properties decreased to 4.66 percent of all loans at the end of Q2 2016. The percentage of loans on which foreclosure actions were started during the second quarter was 0.32 percent, a decrease of three basis points from the previous quarter, and down eight basis points from one year ago. This foreclosure starts rate was at its lowest level since the second quarter of 2000. 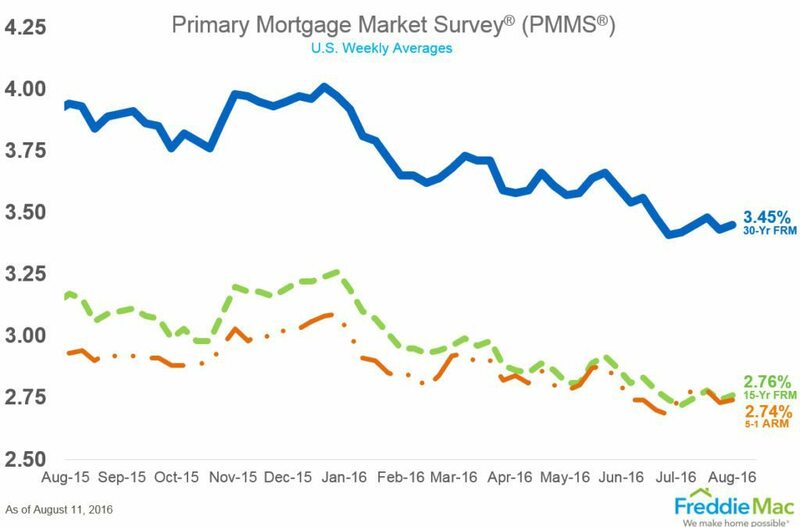 The 30-year fixed-rate mortgage (FRM) averaged 3.45 percent with an average 0.5 point for the week ending August 11, 2016. This is up from last week when it averaged 3.43 percent. A year ago at this time, the 30-year FRM averaged 3.94 percent.